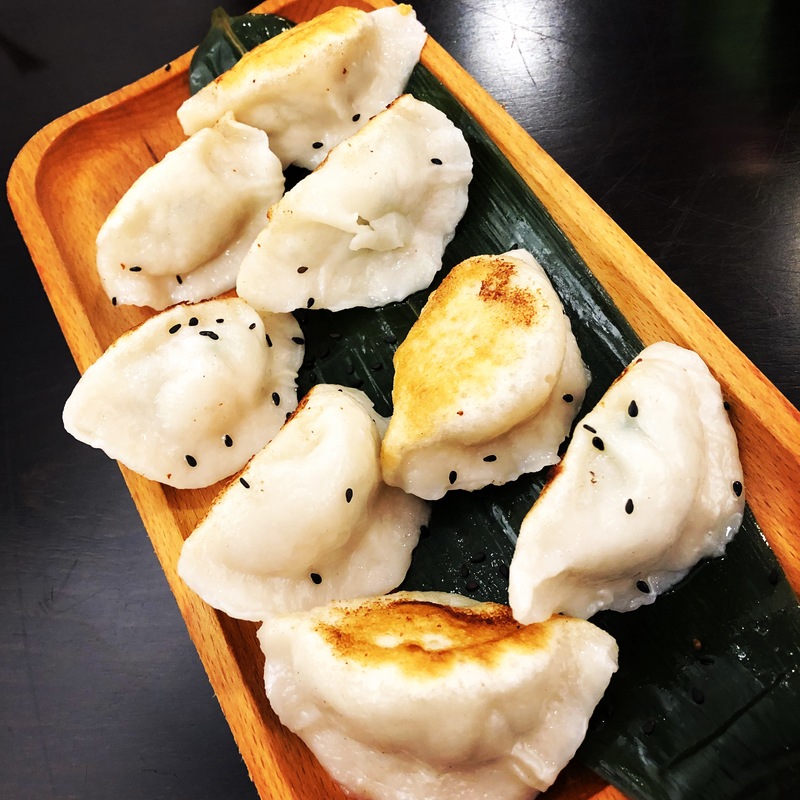 I really enjoyed the house made pork dumplings I had during my first visit to the Upper West Side’s Yu Kitchen. For my return visit I decided to branch out a little on their extensive dumpling menu and try the fish dumplings and the veggie dumplings. I got both orders pan fried, pot sticker style for which they charge an extra buck each, which seems a little lame to me. The fish dumplings were filled with Sole that had been mixed with a small amount of slivered scallions. Usually when you fry or saute sole it is quite light and flaky, but when used as a filling in these dumpling that had been steamed and then pan fried, it took on a little bit of a chewier texture. It had a light fresh, fish taste that I initially thought the scallions would overwhelm, but the chef had balanced the proportions perfectly. The veggie dumplings have green spinach juice colored wrappers and are filled with tofu, finely minced carrot and a type of Chinese green that the waiter could not translate into English for me. They also contain egg, so they are not vegan. These dumplings did not have a strong flavor identity, but made an excellent dipping sauce delivery vehicle. There were a lot of greens in the dumpling and the tofu and egg contributed some protein, so I felt pretty healthy about eating them. Yu Kitchen is on Broadway between 100th and 101st streets, on the East side of Broadway. 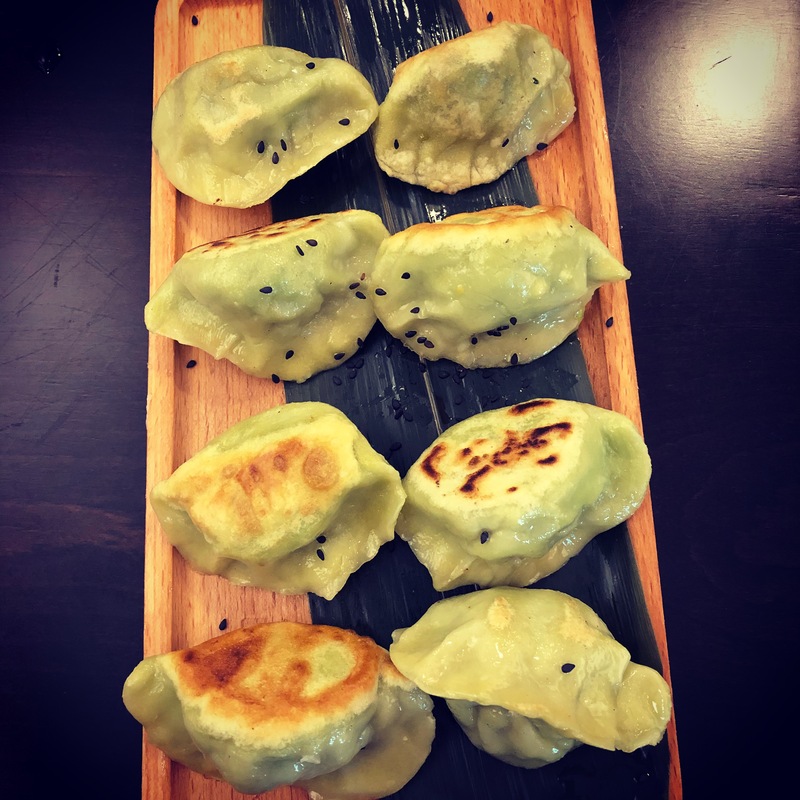 This entry was posted in Chinese, Fish, New York City, Pan Fried, Potsticker, Vegetarian, Veggie Dumplings. Bookmark the permalink.